Freshwater catfish are an often overlooked species of fish available year round in our region of the St Johns River. 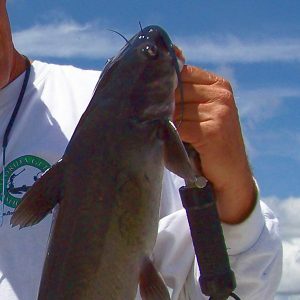 In our part of Central Florida channel catfish are the primary catfish species targeted and can range in size from one to thirty pounds. In spring when the rainfall begins to raise the water level of the St Johns River, channel catfish begin moving upstream out of the three big lakes of Harney, Jessup and Monroe as they like to spawn in moving water. During this timeframe, it is not uncommon to catch up to twenty fish on a full day charter, and again this style of old Florida fishing is a great family activity with some tasty rewards.